A black and white negative of Mrs. Henderson sitting in a wicker chair outside a brick building. 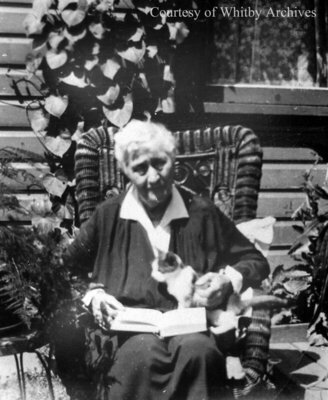 In this view she has a cat and open book on her lap. Mrs. Henderson, November 1938, Marjorie Ruddy. Whitby Archives A2013_040_680B.